Last Saturday, we celebrated Chanukah early with my family because of the threat of snow storms. My brother and his family were not able to make it into town thanks to all of the snow. Since the boys have been born, they have been spoiled by our families. Most of the toys in our house are purchased by people other than us. This Chanukah was no different. Nana and Papa had all of the gifts labeled and ready to go. They wanted to try something different. Rather than give NHL and JSL a present or two and then more another day, they opted to do things Christmas style. Note to casual Chanukah observers: Jewish kids do not really know how to handle present overload when it is not on their birthday. NHL quickly tore through all of the packages and sat staring at his little brother. He wanted to know what was inside all of his wrapping paper. 5 year olds definitely burn through things quickly and 19 month olds want to take each and every item in. In fact, JSL did not understand why more and more was given to him. Still he was sweet and squealed at each and every item given to him. Now of course we have to find homes for all of the new items. We have purchased a lot of new Rubbermaid containers to put things away in and sort for future garage sales. Tonight we will light the eighth and final candle and then will put all of the Chanukah items away until next year. It sounds like they had a ton of fun! Look at all the new goodies that they recieved! I am glad that you are having a wonderful holiday! Thanks for the photos and updates…they are great! I have battled present overload for the longest. 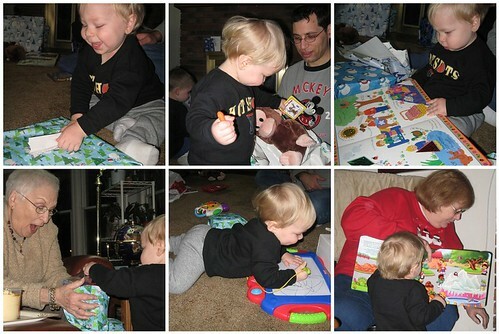 Even at my oldest son’s 3rd birthday I collected the presents and gave them to him one each day. I was so afraid of him ripping them all open and then doing something bratty in front of all of the party guests. You can tell they had fun! We have those stacking blocks as well. They are great. 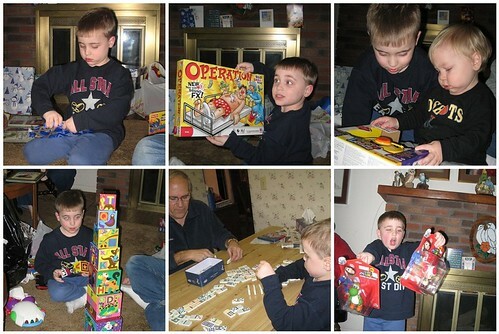 I remember all the games of Operation I played as a kid. He’s going to get a lot of mileage out of that one. Looks like they made out like bandits! Hope you enjoy the last night of Chanukah tonight – hard to believe it’s almost 2009! !